This will give you a general idea of the likely cost of your treatment. It is, however, only a guide, because the time procedures take and the materials we use will inevitably vary from one patient to another. Before starting you on any treatment, we’ll discuss the options open to you and help you decide what best suits both your budget and your lifestyle. And we’ll provide you with a full quotation in advance so there’ll be no nasty surprises when you give you the bill! ** includes 1-year supply top up tube Gel. Occasionally a treatment estimate plan may change during a course of treatment. informed before treatment takes place. Our treatment plans are valid for 6 weeks after their issue date. We respectfully ask for a deposit to secure appointment spaces. Outstanding Fees for treatment are due at the end of each appointment. At Gardens Dental Centre our highly skilled dentists will try to ensure the highest standard of care is provided. We use the latest techniques and best materials all within a modern environment. We value the confidence our patients put into their dental work and in recognition of this our dentists will provide a goodwill guarantee on all inlays, crown and implant restorations. The patient attends the dental hygienist at regular intervals as prescribed by our dentists. The required home maintenance techniques discussed during the treatment are followed. Where prescribed and recommended a night guard appliance is worn to protect against nocturnal grinding or excessive clenching forces. Failure is not the result of tooth decay, gum disease, peri-implantitis (gum disease surrounding an implant). Failure is not due to para functional habits such as finger nail biting, grinding, clenching teeth and pen top chewing etc. No damage has occurred due to dental trauma or undue care. The goodwill guarantee will not be applicable to implant failures in smokers. In the event of the tooth under a crown or filling requiring root canal treatment an additional cost will be borne by the patient. It is unusual for Ceramic crowns to fracture. In the event of fracture, we advise a night guard is worn to protect the teeth from excessive nocturnal force. We can only provide one replacement under the goodwill guarantee, following this the full fee will apply. The guarantee applies to the crown or filling and does not cover any additional work arising from the root canal system failing, necessitating root canal therapy or if the tooth breaks down further leading to a whole new restoration. Note* More details can be viewed in our Terms and Conditions. We respectfully reserve the right to take full payment or a deposit to secure your booked appointments. Failure to attend your appointment or cancelling your appointment at short notice may result in you losing your deposit. If you are unable to attend your appointment you will need to inform us at least 48 hours beforehand. ‘Pay-as-you-go’ : where we accept all of the usual payment methods including Visa, MasterCard, card-supported cheques and cash. Interest-free credit : This option makes cosmetic treatments instantly and realistically affordable, with manageable monthly payments. Our financing plan is a popular option for patients considering cosmetic dental treatments. 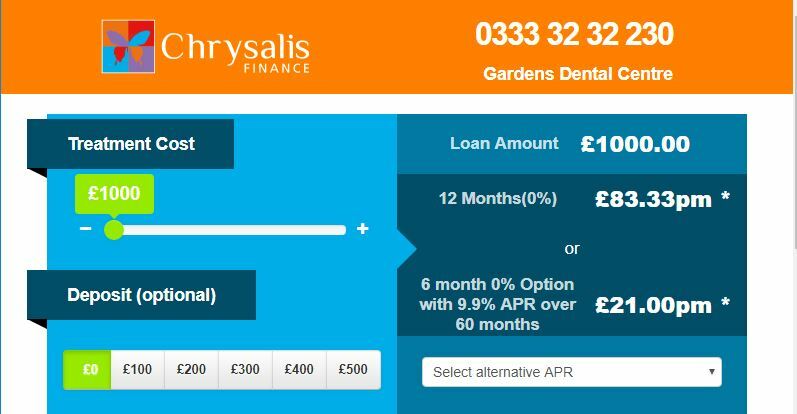 It allows you to spread the cost of your treatment by direct debit over an agreed period that fits within your budget. To work out how you can spread the cost of your treatment please click on the link below and follow the instructions. This will give you a general idea of the likely cost of your treatment. It is, however, only a guide, because the time procedures take, and the materials used will vary from one patient to another. Before starting any treatment, we will discuss the options open to you and help you decide what best suits both your budget and your lifestyle. We’ll provide you with a full quotation in advance so there’ll be no nasty surprises when you receive your final invoice! We will acknowledge complaints within 3 working days and provide a full response within 20 working days.